In this month's edition of How To Fix, we ask the experts for their thoughts on horses who are aggressive about the space in front of and inside their stall. 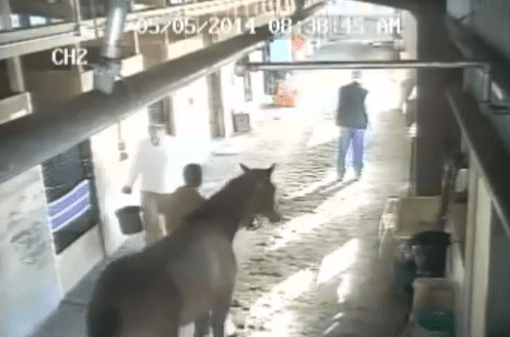 It's not uncommon on a racing barn to see one stall with a traffic cone in front, warning workers and visitors not to walk too close to the stall door. We wondered whether horses in this situation are being territorial and what can be done to soothe them. Dr. Katherine Houpt, professor emeritus of behavioral medicine at Cornell University's College of Veterinary Medicine: Horses aren't supposed to be territorial, but there is some evidence that if the situation is right — for example, if you're on an island and there's water on three sides — then it's worth the time of the stallion to defend that one boundary that he can defend. It's hard to tell whether that's what's happening. It is a small percentage of horses that do that. It may be more a protection of his personal space, which happens to include the aisle next to the stall. Of course you can prevent the horse biting people by putting a stall guard up or something like that. And you can teach the horse to go to the back of the stall and good things happen. You can teach him to back or make sure he isn't interacted with until he has gone two or three steps back from the door of the stall, and then you reward him for that. Whenever you come by, you can say 'back ' or 'corner' or whatever the word is. You have to make sure he's rewarded often enough for that that it's his default. Is voice or clicker training something people can do easily? I think they may think it's too complicated to do in a racetrack setting. For some reason, it takes a lot of willpower, but it's not difficult. All the click is doing is telling the horse he's done the thing he'll be rewarded for. It's not a command. You ask the horse to back. You can push him, and as he takes a step back you click and then he gets the food. If you keep doing that, usually after about 20 times he will know the word and he will back. The other thing is that your timing has to be good. If you click just as he's taking the step back from you, he knows what is right. But if you have to dig in your pocket to get that lump of sugar, he won't know exactly why he's being rewarded because he probably did three other things while you were getting out the reward. And you have to do it often enough that when you've forgotten the reward, the click will still work. The reason people don't like to do it, I think, is it takes too many hands. You have to have the treat, the clicker, the halter you want to put on the horse or whatever. I am terrible about it. I trained one of my horses to back up and the other one to bow, and I just don't do it. The thing you'd think about, if the horse is male and is supposed to be a gelding, is could they be a cryptorchid and still have a testicle in them? I'd try to rule out aggression. You can do a blood test and look at testosterone, then give them a hormone called HCG which tells them 'I need to make testosterone' and see if the testosterone level goes up after that. It's pretty straightforward to figure out if there's testicular tissue still in them. In mares, it's pretty rare but they can get ovarian tumors called granulosa theca cell tumor and those can sometimes cause behavioral stuff where a mare will seem kind of studdish. Usually, they just won't show heat, but rarely they have increased testosterone. There was a mare in France who ended up testing for testosterone who had a granulosa theca cell tumor who got disqualified. I still tell people about that. First of all, that act of aggression, as long as I don't think it's going to hurt an employee, I'm not going to do a whole lot about it. I'm going to put up the cone, and I'm going to alert everyone to walk wide around it, and I'm going to let him be like that. But if that act of aggression has a chance of hurting one of my employees, if he's vicious and he could do some damage on someone, then I'm going to put a full screen on the stall. And I don't like a full screen, because that now increases the claustrophobic effect of the stall, but if I'm forced to do so for the health of an employee, I will. I've had horses like that before. Owen's Troupe was the meanest horse ever. I had to custom-make him a screen that went all the way up to the top and down. He was this black horse with these dark eyes, and he'd stand there looking at you. He would gallop, dump the rider. He would stop, turn around and strike at them on the ground. But he was a great horse. I ran him 23 times and he won most of his starts for me. Great horse, so we put up with him, but he was mean. A lot of times the grooms were afraid to deal with him. I knew how to work around him, so I went in there one day to put bandages on. You know how a horse starts moving while you're wrapping them and you sort of tap them in the belly? I didn't think about it. I reached up and did that, and Owen went, 'Oh let's go!' and started rearing up in the stall, pawing at me. You didn't put a hand on that horse, you just tried to work with his attitude, and that's what I tried to do. This entry was posted in Horse Care, How To Fix, NL List and tagged aggressive horse, dr. bryan waldridge, dr. katherine houpt, equine behavior, gary contessa, how to fix, stall aggression, territorial horse by Paulick Report Staff. Bookmark the permalink.